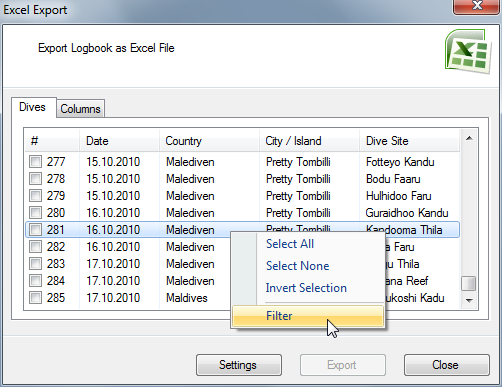 With the new filter window, you can create filters for any output window (logbook, details data, table editor, dive site map, statistics, printing and exports). 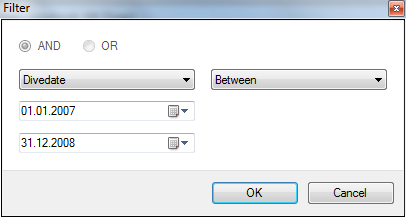 Filters allow you to view, export or print only a subset of your logbook data, based on any criteria you want. For example, you can now view the statistics just for one year or just for your rebreather dives. You can export or print only dives where you’ve dived with just one particular buddy. Or you can view in the map window only dive sites, which are deeper than 30 m and with a rating of 5 stars (just an example). 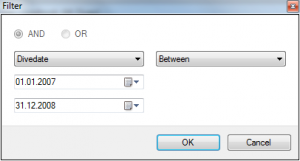 Then you will see on the right side of the current window the new filter toolbox, where you can add with “AND/OR” any number of criteria for every database field. As soon as you add, edit or delete filters, you can see the results live in the output window. 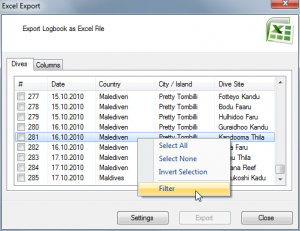 To edit a filter row, just double click it or hit the edit button in the toolbar. That way you can easily refine your filter until you get the data you want. You can save your filter to a file and reload it later on. You can also exchange filters between identical database tables, e.g. between statistics, logbook and table window or between dive site details and dive site map. Click here to download the update beta setup file. This is an update from the current version 5.0.6. If you have an older version than 5.0.6, please update first to 5.0.6 and then install the beta update. Please let me know how you like the new filter function, if it works for you or if you see any crashes or bugs. The filter function integrates deeply into many parts of the application, so I want to make sure I’ve not broken any existing functionality. This entry was posted on Saturday, April 21st, 2012 at 8:05 pm and is filed under Diving Log 5.0. You can follow any responses to this entry through the RSS 2.0 feed. Both comments and pings are currently closed. Excellent feature! I was really missing this!! Just one more thing would be nice: It would would be great to see the number of dives applying to the rule. For example: If I want to know the number of all my Nitrox dives, I add a new filter rule “O2” “Is greater than” “21” and get the complete list, but I have to COUNT all the dives myself!! !